Unlucky 13 for PNE as we suffered our first league defeat since New Year’s Day. To be honest Reading were good value for their win and although North End rallied a little later on, few in the travelling contingent of 1,816 could argue with the result. The team lacked energy and urgency and it was as if the international break had sucked the life out of them instead of recharging their batteries. Yes,we had some players missing but I can’t use that as an excuse because we had good enough players on the pitch to give the home side – who are in a relegation battle – a much better run for their money than the lethargic, lack-lustre performance that was delivered. Preston started with three changes to the side that beat Birmingham with Robinson, Gallagher and Earl coming back into the team. PNE started comfortably enough and although Reading looked more dangerous on the ball it was a mediocre first 30 minutes in which we hardly threatened the Royals’ goal. Just before the half hour Reading took the lead when a lovely through ball and cross was met by Meite at the back post giving Rudd no chance. Five minutes later it was two when the usually reliable Ben Davies under hit a back pass and Barrow sneaked between Rudd and Storey to give the home side what proved to be a winning lead. Rudd made a fabulous save just on the stroke of half-time to save us from further embarrassment. The second half started with Stockley and Barker on for the ineffective Robinson and Nmecha. Barker’s impact was immediate and he had a couple of runs down the left causing real grief to the home side’s defence. Unfortunately after 10 minutes of the second half he pulled up with what looked like a hamstring problem and had to be subbed himself. It was just what we didn’t need and with Pearson struggling we were under pressure having used all three subs. Preston got back into the game a little but struggled to put any pressure on the reading goal. In the last 15 minutes the home side started to tire and we got into the action a bit more. The goal eventually came , but far too late, when Stockley knocked home a rebounded Maguire shot off the post. North End hadn’t enough time to search for an equaliser and the 12-game unbeaten run had gone. 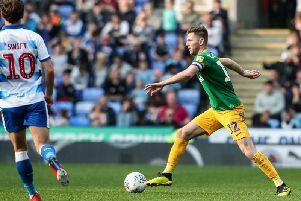 It is not the end of the play-off hopes but it is a setback and, more worryingly, was the level of performance on the day. Games against teams near the bottom of the league are always tough encounters and this proved to be no exception. I thought the level of intensity was well down on what it had been in recent games and maybe the numerous injuries to the squad are beginning to tell. I hope we don’t run out of steam because this has been a brilliant recovery from being bottom of the league on October 2. The next seven days will certainly tell us one way or another whether we are in with a shout of the play-offs.